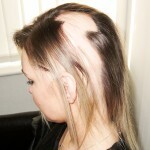 A beautiful and natural solution for hair loss caused by chemotherapy and cancer treatment in Bristol. “Losing my hair affected me most. It was my favourite thing about me.” Anya, Hair Solved Client. Hair loss is one of the most well-known side effects of chemotherapy and cancer treatment. At Hair Solved we understand how upsetting some women can find losing their hair, on top of everything else they are going through. If you have experienced, or are worried about losing your hair as a result of cancer treatment, we are here to help. Whether you have patchy hair, total hair loss or are experiencing re-growth after chemotherapy, our Enhancer System could be the right solution for you. Many of our clients find it preferable to wigs which can be expensive, heavy, unrealistic and don’t feel secure. The Enhancer System is exclusive to Hair Solved and uses a light flexible mesh applied to the scalp and 100% real hair extensions to create the look and feel of natural hair – allowing you to look yourself again and restore your confidence following chemotherapy. The system fits securely, so you can wash your hair, shower and even go swimming as normal and as your own hair grows back, we can adapt the system around it. Just complete our short form and we will contact you to arrange your free, no-obligation consultation in Bristol or at one of our nationwide salons. Alternatively, you can call us free on 08000 654501, or visit our website to find out more and why thousands of women choose Hair Solved. Please quote reference HS4 when calling. Can my hair grow back underneath the Enhancer System? Yes. The Enhancer allows your own hair to grow back. It’s a particularly suitable and effective solution for hair loss caused by chemotherapy, physical or psychological trauma, ill health or trichotillomania (hair pulling).